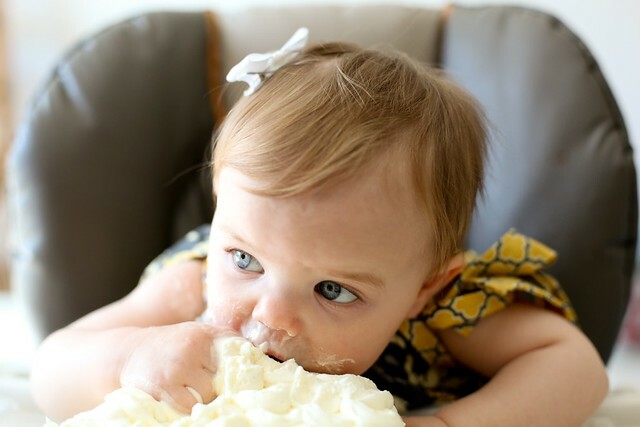 Cliche though it may be, I truly can’t believe that a year has already passed since our sweet baby girl was born. It seems like just yesterday we were on the way to the hospital filled with excitement and anticipation. But, in some ways this year has been very dark and very long for our family. Through the sadness and the rough times, our kids have been the bright spot. Caroline has the happiest, sunniest personality of any child I have ever met. She is so very content, always smiling and giggling, which in turn keeps us smiling a lot. When I was a baby and a little girl, my mom would sing “You Are My Sunshine” to me every morning when she got me out of bed. In turn, I sang it t0 Caroline from the day we brought her home from the hospital and still like to sing it when we sit in her rocking chair. 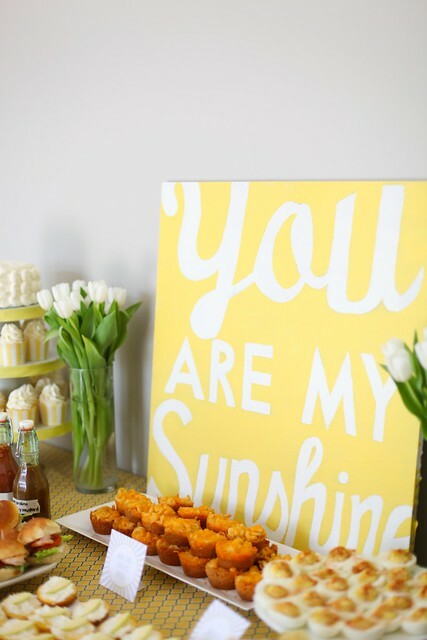 So, on many levels, a sunshine themed party was perfectly fitting for our darling girl. Funnily enough, the weather was atrocious the morning of her party – pouring rain, dark skies, just ugly. About an hour before party time, the clouds broke, the sun shone through, and the rest of the day was gorgeous. It could not have been more perfect. Those close to us know that our nickname for baby girl is actually Carolina Barbecue (a play on her full name, Caroline Barbara). 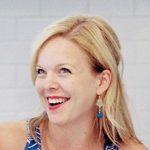 Ben said it one day, I scoffed, but then somehow it stuck, and now I find myself calling her “BBQ” at least as often as I call her Caroline. (I’m sure she’ll love this as a teenager.) 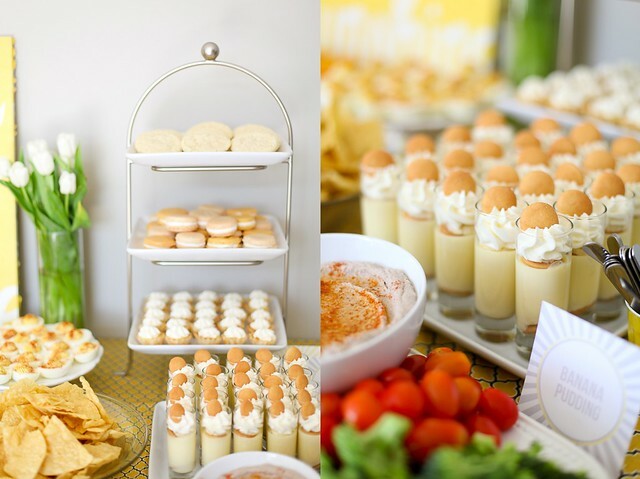 Anyway, in honor of her nickname, we knew we had to serve actual Carolina-style barbecue at the party, and from there I took off and ended up with a Southern food theme with a sprinkling of additional yellow and white dessert items. Of all the parties I’ve ever hosted, I had the most fun with the food for this one and I think it was the most well received. 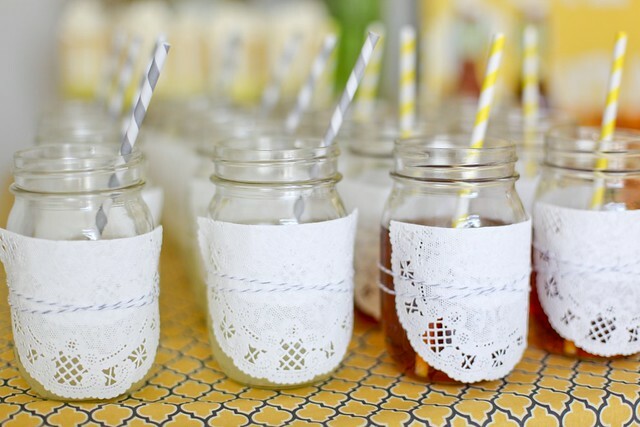 Just when I thought I couldn’t love mason jars more, I added a feminine touch by wrapping them with doilies and a bit of baker’s twine. An unforeseen bonus was that the doilies were perfect for writing names on so guests were able to keep track of their drinks. 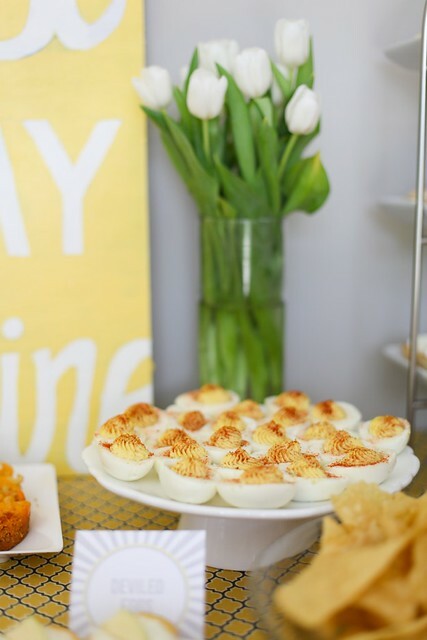 I have an uncanny ability to work deviled eggs into each and every party. Thankfully it wasn’t much of a stretch for this particular theme! 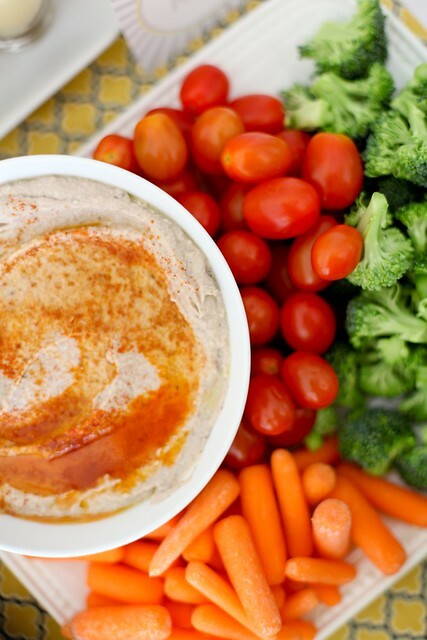 I haven’t made black eyed peas before and was a bit skeptical while they were cooking, but I actually really loved this hummus and have been eating it daily since the party! 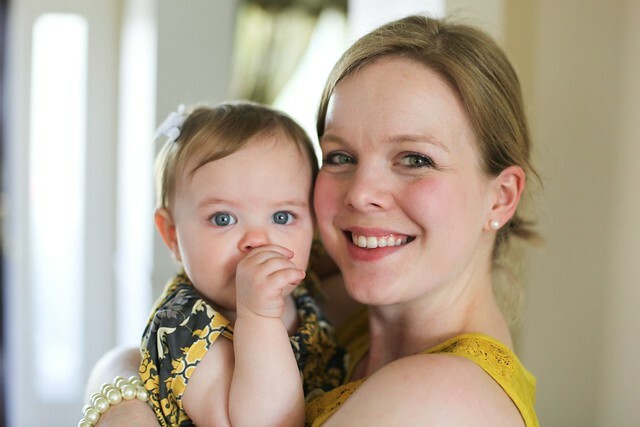 For first birthday parties, I think it’s fun to put out the baby book and any other photo albums from the year so guests can read about the pregnancy, early days, special moments, etc. People seemed to looking through all of it. 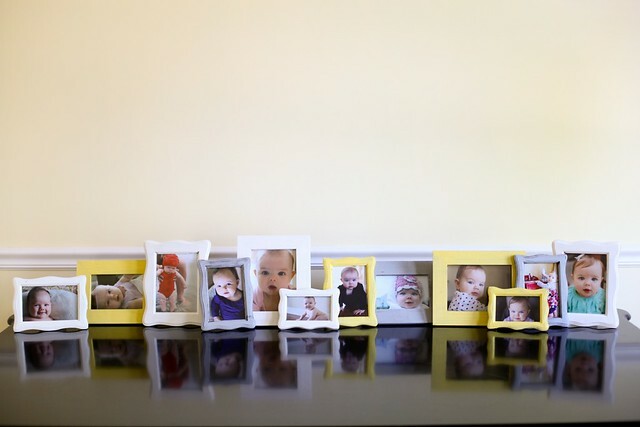 I also bought super cheap picture frames from Joann’s in a variety of sizes, painted them to coordinate with the yellow/grey color scheme, and used them to display a photo for each month of Caroline’s life so far. Loved this detail so much. As usual, I made my signature sugar cookies decorated with royal icing as party favors. I used the technique from this post to create clouds in the grey sky background (no marbling, just dotting). It turned out so well! 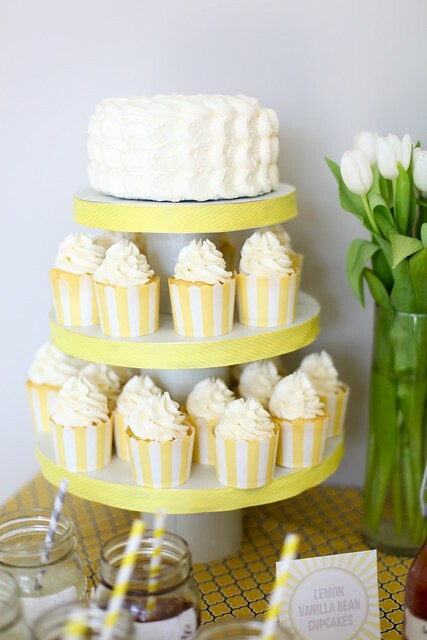 As usual, my favorite way to display cupcakes and cakes for parties is by using my homemade cupcake tower method. I think I’ve been using the same three cans over and over for about three years now! 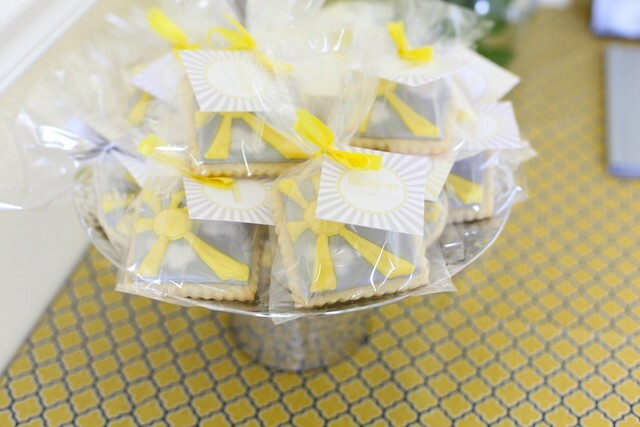 So easily customized, festive, and adds visual interest to any dessert or food display. As you can see, the birthday girl went for her smash cake like an old pro. It was hilarious! This past year with our girl has been so amazing, and we can’t wait to see what the next year will bring. We love our sweet Caroline! 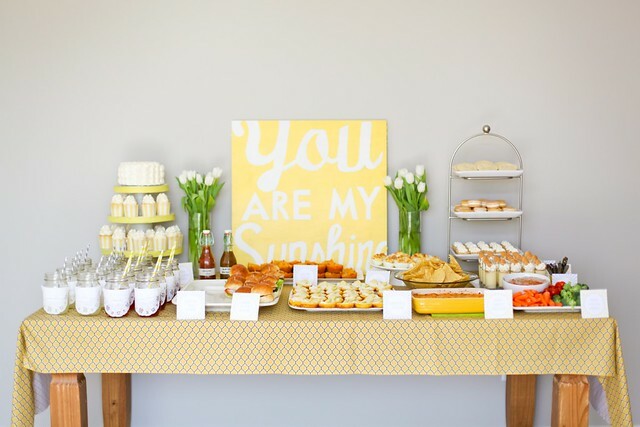 *For more information on my party planning strategies, see this post.